Defragmentation software works by moving the fragments around your hard disk drive into a continuous stream. This will, in theory, speed up your boot and program loading times. If you choose the right package, and schedule it to run once a week in the background when you're not doing anything major on your PC it can work. In fact, we shaved 40 seconds off our boot time. The Windows' bog-standard bit-rearranger isn't actually that bad. Even if It lacks any kind of visual interface, which makes it hard to know exactly what it's going on during the whole process. In Windows 7 and Vista it can be scheduled from within the Scheduler to run daily, weekly or monthly. In terms of speediness, it proved to be one of the better options, coming in at a shade under an hour and leaving us with 0 per cent fragmentation. Of course, this was Windows 7's defragmenter: XP's slow, tricky-to-schedule package is worth avoiding. Between this and Security Essentials, Microsoft finally seems to be packaging software that's almost as good as the paid for stuff. It's not the most aesthetically pleasing of defraggers – actually, being invisible, there's nothing aesthetic about it at all. But it does do the job, even if it won't let you adjust the higher-end settings. Piriform's Defraggler is, unfortunately, not designed for untangling muppets (or fraggles). It is, instead a really easy-to-use defragmentation program, and it even lets you defragment individual files and folders. So if you've got a giant Steam library, you can set it to scan and defragment that (although Steam does have its own defragging system, but you'll need to run this manually), while ignoring little-used applications, like Microsoft Office. 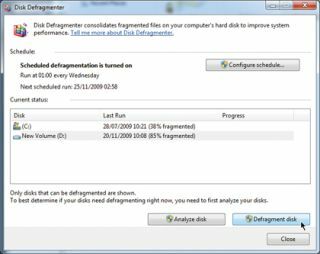 As with the Microsoft's Disk Defragmenter Tool, you can schedule Defraggler to run daily, weekly or monthly. It's got a nice visual representation of what's going on that doesn't look like Jim Carrey's neural structure. Unfortunately, at a duration of over 90 minutes, Defraggler took the longest to do its business, which is an epic fail from one of the most promising packages in our test. Ah, the humble Australians. Not content with dressing up as kangaroos to fool the rest of the world that they're real animals, they've also come up with a defragmentation tool. It's quite bonza, too, and as well as defragging it will rearrange your bits to maximise free space on your drive. Smartly, it will even move system files to fastest area of your hard drive, so it's worth running just once to get everything in its right place, to quoteth Radiohead. Disk Defrag can be set to run on more than one drive at once, so if time's not on your side and you've got 16 hard drives you can do'em all in one swoop. If Father Time is breathing down the back of your neck, the Auslogic option will defragment your hard drive in just 38 minutes. There is a catch: it only got our hard drive down to a level of 21 per cent fragmentation, when the rest managed 0 per cent. Not bad, but not great either.If you're going to defrag, you might as well do the whole lot.